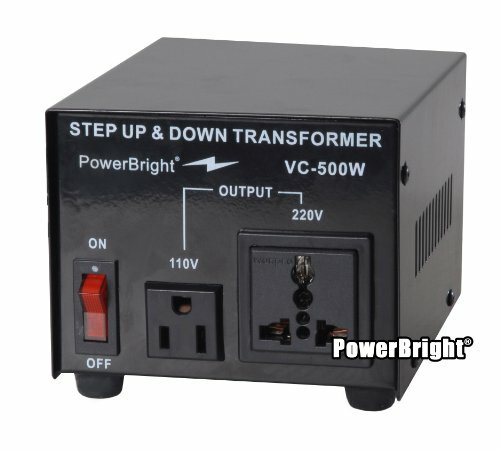 Product description 500 Watt maximum capacity heavy-duty continuous use transformer. 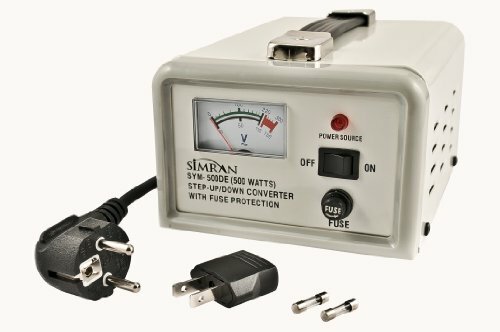 Converts single phase 220/240 Volts down to 110/120 Volts. Compatible with both 50Hz and 60 Hz. Hard wired with a European Shucko plug also good for Asian outlets. One grounded outlet in front of unit (accepts 3 or 2 prong US and Euro plugs). Built-in fuse protection. Durable design with a heavy-duty cord. 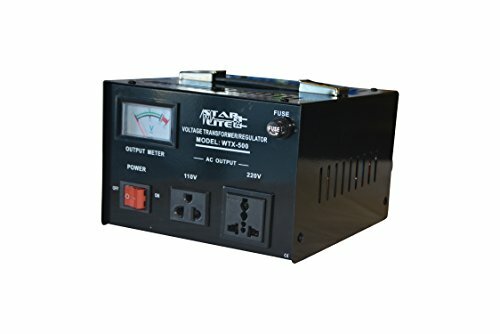 * CE Approved and Certified From the Manufacturer 500 Watt maximum capacity heavy-duty continuous use transformer Converts single phase 220/240 Volts down to 110/120 Volts Compatible with both 50Hz and 60Hz One grounded outlet in front of unit (accepts 3 or 2 prong US and Euro plugs) Hard wired with a European Shucko plug also good for Asian outlets Built-in fuse protection Durable design with a heavy-duty cord CE Approved and Certified. Weight: 8 lbs. 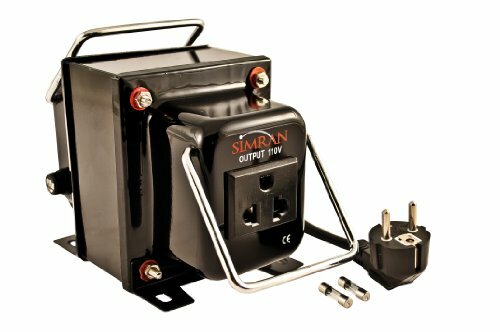 500 Watt Maximum Capacity, heavy-duty continuous use transformer » Converts 110/120 V to 220/240 V OR converts 220/240 V to 110/120 V (switch is on back of unit) » On/Off switch with indicator lamp » 3 outlets on front of unit (outlets accept 3 or 2 prong US plugs and 2 prong Euro/Asian plugs) » Insulated power cord is hard wired with a grounded European Shucko plug also good for Asian outlets » Comes with 2 prong US adapter to enable non-grounded use in the USA, Canada and Mexico » Easy to carry with attached handle, heavy-duty metal casing, fuse protected Weight: 9 Lbs Dimensions(LxBxH): 4.8" X 6.0" X 4.1" Transformer Purchase Guide: Remember to leave at least a 60%-70% slack for the transformer. For the TVs, the power surge margin is 5 times the wattage of the TV. Heating appliances, laser printers and power tools spike when you turn them on. 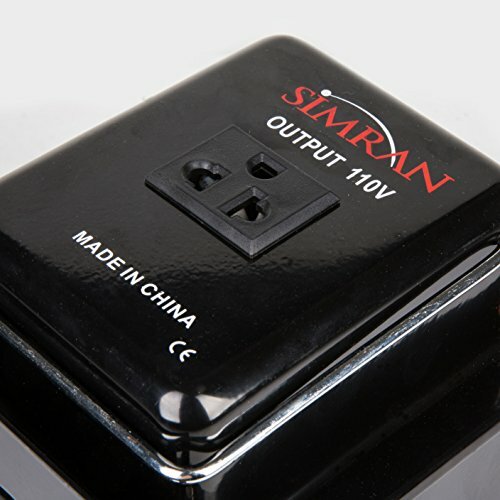 For these products you need to buy a transformer that is at least 3 times the items capacity. 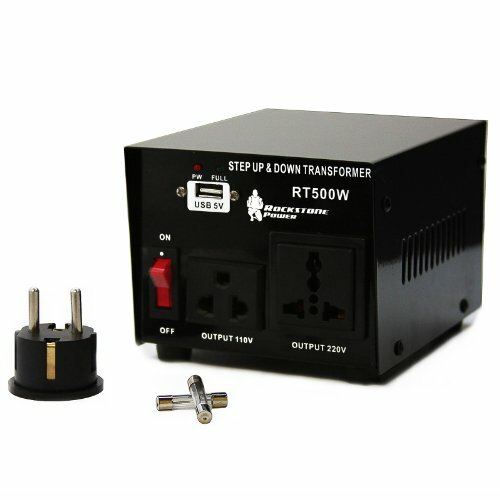 500 Watt Step up and down Two Way Voltage Transformer with Automatic Voltage Regulator - Converts from 220 Volt to 110 Volt and 110 Volt 220 Volt. 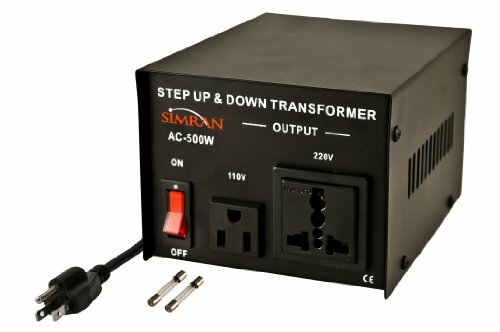 Simran SYM-500 Deluxe 500 Watts Step Up / Step Down Voltage Transformer AC 110V / 220V / 240V Voltage Converter for Worldwide Use. 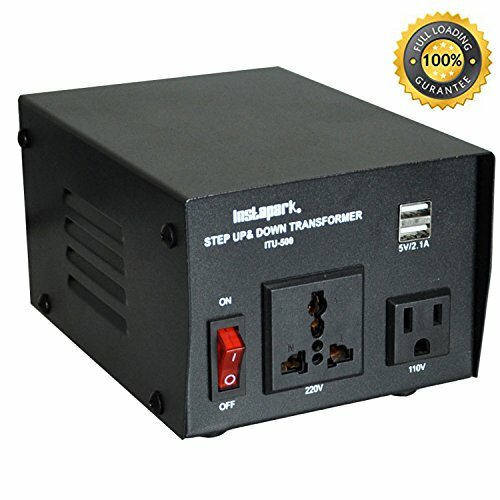 500 Watt Maximum Capacity, heavy-duty continuous use transformer » On/Off switch with indicator lamp » Analog meter on front of unit measures exact input voltage » Converts 110/120 Volt up to 220/240 Volt OR Converts 220/240 Volt down to 110/120 Volt » 3 outlets on rear of unit (outlets accept 3 or 2 prong US plugs and 2 prong Euro/Asian plugs) » Insulated power cord is hard wired with a grounded European Shucko plug also good for Asian outlets » Comes with 2 prong USA plug to enable non-grounded use in the USA, Canada and Mexico (grounded 3 prong US adapter also available - Item No. 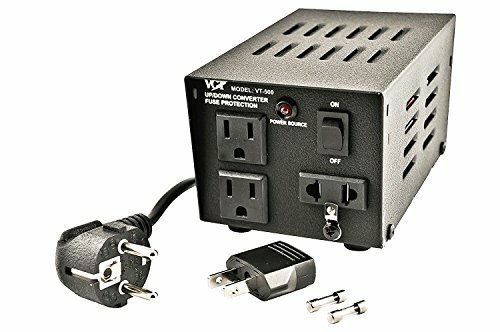 VP 13) » Easy to carry with attached handle, heavy-duty metal casing, fuse protected Weight: 10 Lbs Dimensions(LxBxH): 11" X 7" X 6" TRANSFORMER PURCHASE GUIDE: Remember to leave at least a 100% slack for the transformer. For the TVs, the power surge margin is 5 times the wattage of the TV. Heating appliances, laser printers and power tools spike when you turn them on. 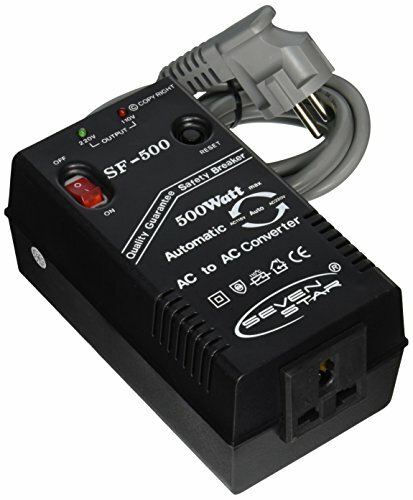 For these products you need to buy a transformer that is at least 3 times the items capacity. Copyright © Wholesalion.com 2019 - The Best Prices On 500w Heavy Duty Step Online.